(CNN) -- Mark Wooten, 41, was devastated when his supervisor told him in November that he was being laid off from his job as a forklift operator in Norfolk, Virginia. It was the first time in his adult life he'd been out of work; just a month earlier, he and his wife, Caprice, had moved into a new apartment with their two 15-year-old daughters. 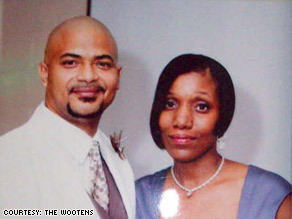 Mark and Caprice Wooten made several healthy lifestyle changes after he got laid off. "It's hard," Mark said. "We've made tremendous cutbacks." "Me being out of work and trying to file for unemployment, going through hard times and tribulations -- I told [Caprice], 'You can be my inspiration, and I can be yours. We'll keep each other motivated, even on days we don't want nothing to do with the gym,' " Mark said. The Wootens also started eating better. To save money, they cut out fried foods and pork, which got easier when they stopped eating out. Meals now are built around chicken, fish and vegetables. Caprice says she's dropped 16 pounds, and Mark feels better than he has in a decade. People are skimping on medicine, too. IMS, a research firm that tracks pharmaceutical sales, reported in October that Americans are filling fewer prescriptions; it was the first drop in a decade. Do suicides go up when the economy heads south? Yet amid the ominous signs, there may be a silver lining, according to Christopher Ruhm, an economist at the University of North Carolina at Greensboro. His research links hard economic times, surprisingly, to lower death rates and better overall health. For one thing, Ruhm says, when people tighten their belts, they tend to cut down on vices like smoking and drinking. They also get into fewer accidents. According to the Federal Highway Administration, Americans are driving about 2 percent fewer miles than they did a year ago. They're also driving more carefully: The road fatality rate per mile traveled is down 6 percent. But the good health trends aren't limited to fewer traffic accidents and less reliance on so-called vices. In a 2007 paper, "A Healthy Economy Can Break Your Heart," Ruhm calculated that a 1 percent decrease in the unemployment rate corresponds to a 0.75 percent increase in deaths from coronary heart disease. That doesn't sound like a lot, but that adds up to an additional 3,900 deaths in the United States in a given year. Why would a strong economy be less healthy? That's the tricky part: Ruhm's numbers are based on raw mortality data; they don't hold the answer. But he does have a few ideas. Other benefits are indirect. For example, during a recession, the use of public transportation goes up, which corresponds to more physical activity. Ruhm also speculates that during a downturn, people might spend more time with friends and loved ones, the kind of social support that other studies have linked to good health. "Not everything gets worse," Ruhm said. "Health is complicated. People think it's determined by medical care, and obviously that makes a difference, but it's not the primary thing. There are all these lifestyle factors, all these other things that are not well understood." The idea that bad times could be good for you alarms those who say it could lead us to shrug off problems caused by lack of insurance and growing poverty. "There's more hardship," says Dr. Camara Jones of the Centers for Disease Control and Prevention, who studies how social conditions impact health. "People are making choices between eating and taking their medications. If you can't afford to smoke, that's good, but if you can't afford to smoke, you may not be able to afford to eat." Marianne Smith, chief development officer for the Food Bank of Southeastern Virginia, says the Wootens are an inspiration, but she worries that many families are too overwhelmed to follow suit. In the past six months, Smith says, her organization has provided free food to 273,000 people, compared with just 250,000 in the 12 months before that. Smith says that staying healthy in tough times, especially eating a healthy diet, is a major challenge. "Nutritious food is expensive, if you think about it. Fruits and vegetables and meat are more expensive than Ramen noodles or junk food." Beyond that, the cold hard truth is that being laid off is stressful. "It was shocking," Caprice Wooten said of the news that her husband had lost his job. "You're just wondering how you're going to make ends meet." That stress has an effect: the incidence of depression is higher during a recession, as evidenced by higher suicide rates. Ruhm says he isn't oblivious to the dangers. He warns that some health benefits will fade if the recession lingers three or four years and adds that we may be in uncharted territory. "If what's going on now becomes more severe than anything we've seen since World War II, then all bets are off." For Mark Wooten, unemployment has been a slap in the face. He's applied to dozens of jobs with no callbacks. The gym is an escape. "For me, it's a great stress reliever. I'm just trying to get a fresh start. Once I get out of the shower [at the gym], I'm geared up for the whole world again."